How can I add Facebook content to my social wall? To add Facebook pages, page mentions or albums as sources to your social wall, you first need to connect your Facebook account to Walls.io. To do that, go to Settings > Sources in your Walls.io dashboard, select Facebook and click "Connect". This is something you will only need to set up once. 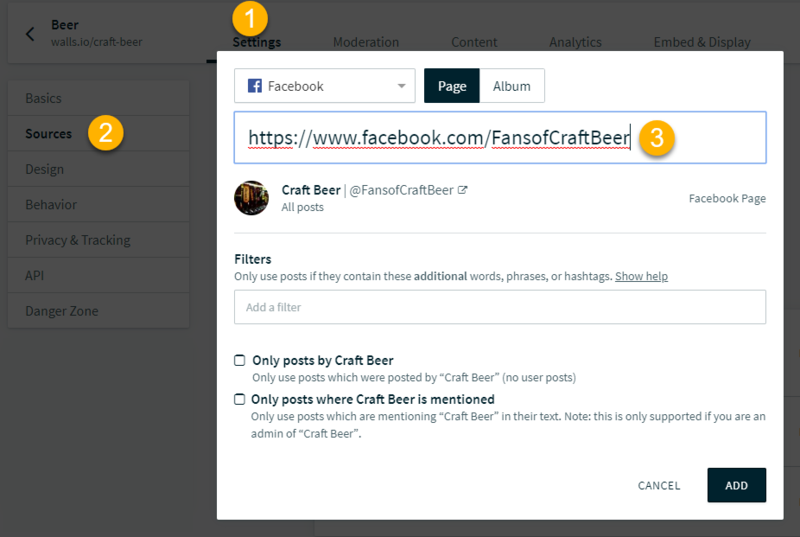 In order to add a Facebook page as a source to your social wall go to Settings > Sources in your Walls.io dashboard and select Facebook > Page. Add the URL of the page you would like to pull posts from and click "ADD". It is possible to fetch posts where your page was tagged/mentioned. However, if those posts originate from user profiles (instead of other pages) we cannot display the image and name of the person that created the post. To add a Facebook album as source to your social wall go to Settings > Sources in your Walls.io dashboard and select Facebook > Album. Then simply add the URL of the Facebook album that you would like to add to your wall and click "ADD". Unfortunately, the Public Search API, which was used to find posts from Facebook by hashtag has been discontinued by Facebook on April 30th 2015. 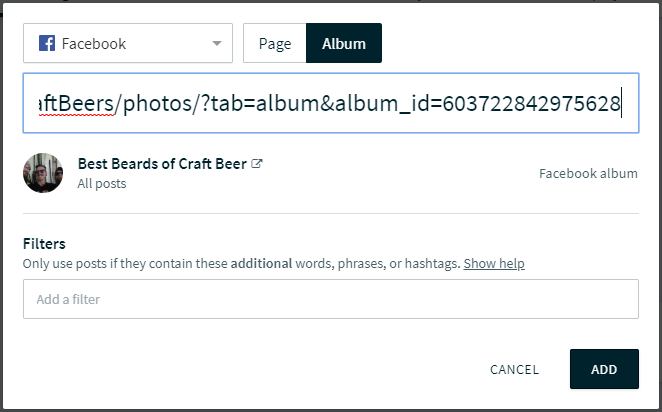 This means that searching for public posts from user profiles containing keywords/hashtags is not possible anymore.